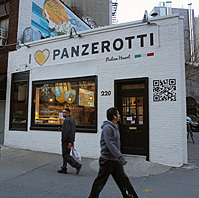 Deep-fried calzones called "panzerotti" are the specialty of the house at I Love Panzerotti in the West Willage. The pizza pockets come with a variety of fillings, both sweet and savory. On the savory side, there is Jala Honey (mozzarella jalapeño, honey & nduja), Zola Sausage (mozzarella, gorgonzola and sausage), and Artichokes (mozzarella, artichoke and spinach). On the sweet side there’s S’mores, Nutella and Pistachio calzones. Italian sodas and Italian craft beers are also offered. For an added fee you can convert your calzones into heart-shaped creations. What's not to love?